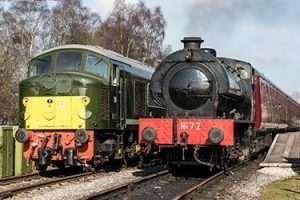 Whether it’s simply a nostalgic journey back to a bygone age or a discovery of the sights and sounds for very first time of a steam or diesel locomotive Peak Rail welcomes you to experience the thrill of our preserved railway whilst travelling through the delightful Derbyshire countryside. The line forms part of the old Midland Railway line between Manchester Central and London St Pancras which was closed in 1968. We currently operate on approximately 4 miles between Rowsley South Station and Matlock Platform 2. As well as our normal train journeys, there is something for everyone to enjoy, luxury dining is available on our Palatine Restaurant Car which offers Sunday Lunches, Christmas Lunches, Afternoon or Cream Teas and operates on various days during the year. A whole host of various special events take place throughout the year perfect for all the family or enthusiast. Why not treat yourself or a family member to one of our very popular Steam Experience driving courses. We hope to greet you as a visitor during 2019 – you are assured a friendly Derbyshire Welcome. Sorry, there are no trains running today.